We will have to wait until 2018 to see the British Bloodhound SSC attempt to hit it’s 1,000 mph target. We were promised that the car would make it’s first runs in 2017 but due to a ‘short term cash flow problem’, we will have to wait until next year. 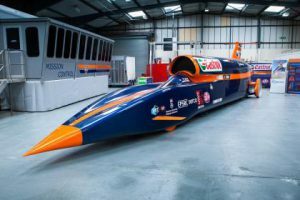 Richard Noble, Bloodhound SSC director told the BBC that they are waiting for funds to come through new sponsors, and the car may need more power as it could weigh more than initially expected. Some lucky people will have seen the Bloodhound SSC at last year’s London Motor Show and we can’t wait to see it hitting ludicrous speeds in the desert next year.